Howdy, knitters! It’s been a crazy month. Thanks for coming over to check out the blog. If it’s your first time here, you might enjoy checking out my knitting origin story and poking around the other blog posts as well as this one. If you’re a returning reader, it’s great to have you back. Today, I’m excited to be writing about my new favorite knitting book — Sock Architecture by Lara Neel, published by Cooperative Press. Before jumping into that, let’s take a look at what else has been going on in my knitting world lately. Sock Architecture: my new favorite bedtime reading book. For me, the biggest news in podcasts is that I changed up my podcast workflow. The short version is that I’m now using the Downcast app on my phone instead of iTunes and my ancient iPod nano to manage how I listen to podcasts. Making this move is something I’ve been thinking about doing for a while, but I finally committed to it once I realized that something was wrong with downloading episodes of The Yarniacs Podcast through iTunes. It just stopped working for me — all of my other podcasts were fine, but no matter what I tried, I couldn’t get an episode of The Yarniacs to download. It made me sad. I wasn’t the only one having the problem, either. After a bit of troubleshooting, I gave up and switched over to Downcast. I’m glad I made the switch. I’m no longer tied to my computer at home to get new podcast episodes, which is great. One of my favorite features is the ability to listen at a faster playback speed. I’m finding that I can easily listen at 1 1/4 speed. Doing that means that I get to keep up with all my podcast listening easier. If I’ve got plenty of time, I will listen at regular speed, but being able to speed up is nice. Another podcast highlight is the read-a-long happening at Ewe University. We’re reading Quiet: The Power of Introverts in a World That Can’t Stop Talking and having a great discussion in the Ewe University Ravelry group. I started reading this book last year, when I first heard about it, but it got shuffled away. I’m thrilled to have a good excuse to dig it back out. It’s especially great to be reading it with my knitting friends over at Ewe University. Yarn Thing with Marly Bird continues to grow on me as a favorite, too. I’m not just saying that because I won another of the call-in contests, either. 😉 I love how Marly talks to so many people in the fiber industry and is able to pull the curtain back and give a behind-the-scenes peek at how things work. This “inside baseball” kind of thing is really cool to me. NH Knits is another fun listen for me. Claire was kind enough to give me a shout-out in Episode 010, which was really cool. Episode 011 featured a visit to shearing day at the farm, which was lots of fun. Lara Neel re-released another slew of her Math 4 Knitters podcast, bringing the re-released episodes to 19. Years later, these podcasts still hold up — I didn’t hear them when they were originally released, and I’m loving them now. I’m definitely looking forward to Lara getting caught up with the re-releases, and I hope she steps behind the microphone again to pick up where she left off. In addition to hosting this excellent podcast, Lara is the author of Sock Architecture, which I’ll be discussing later in this post. All the podcasts I’ve been listening to continue to be enjoyable. I’m continuing to keep my needles clicking working on various projects. It’s a lot of fun. 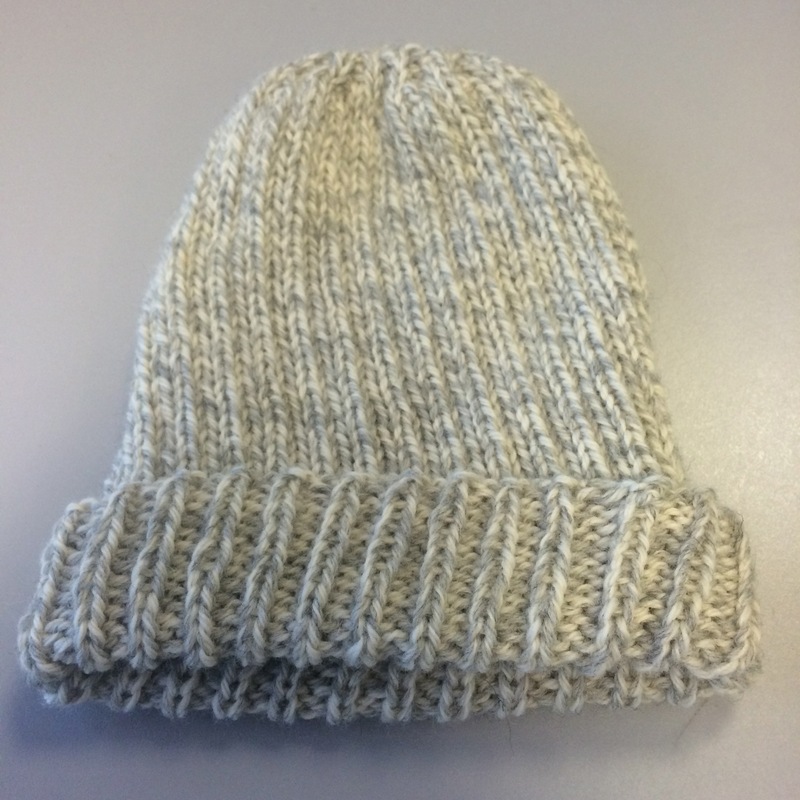 At the end of January, I did my December/January charity knitting by knitting up the Modern Ribbed Hat. It was a quick knit, and fun. 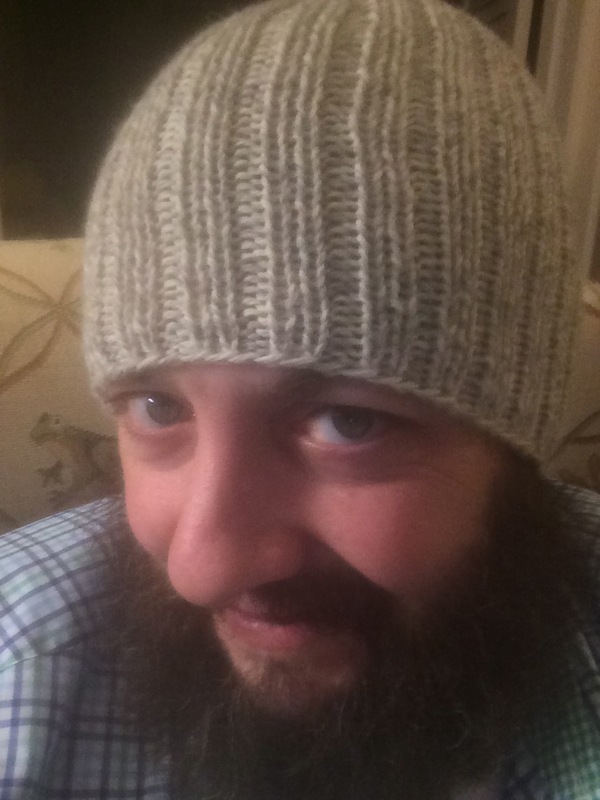 The size was for a child, where it would be a bit of a slouchy hat, but I also like the way it fit me as a beanie-style hat. I think it would be excellent for cold-weather camping. A quick knit for charity. Supposed to be slouchy on a child, I like it as a tight-fitting beanie for me! 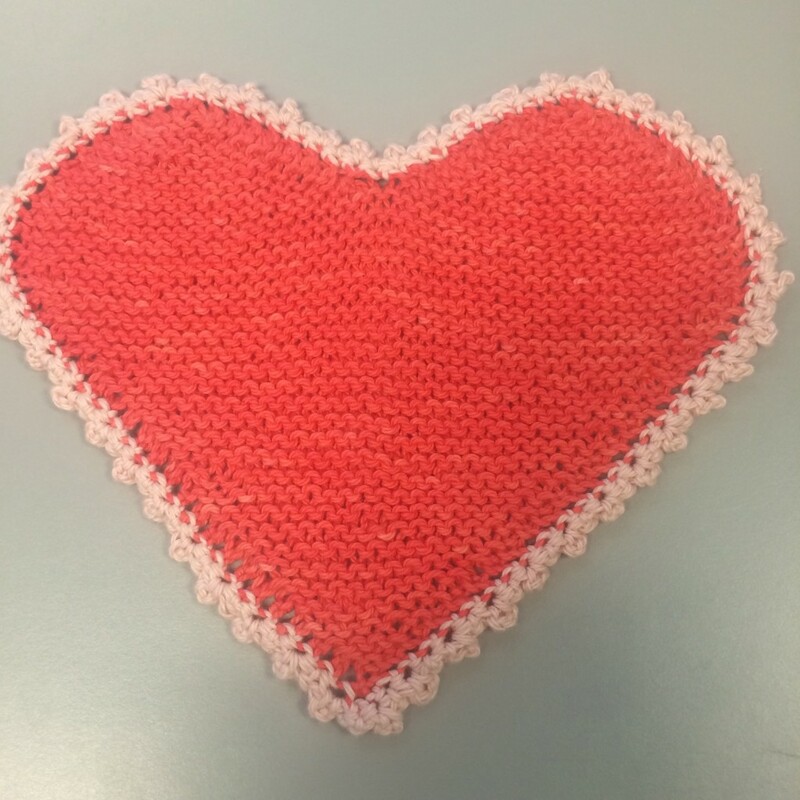 In the middle of January, I knitted up a Valentine Washcloth for my secret pal in a swap on Ravelry. This was a lot of fun. The bulk of the project was simple knitting, but the addition of a crocheted edge gave it a nice finishing touch. I got some of my friends to show me how to do a little crochet and I’m really happy with how my project turned out. My SP was happy with it, too. I had fun learning how to crochet along the edge of this fun washcloth. We finally made it to my parents’ house to celebrate Christmas, so I was able to give my mom a couple of presents that I had knitted for her. The first was a skinny triangle scarf. This was a fun knit and was accomplished by holding two yarns together and knitting them together. 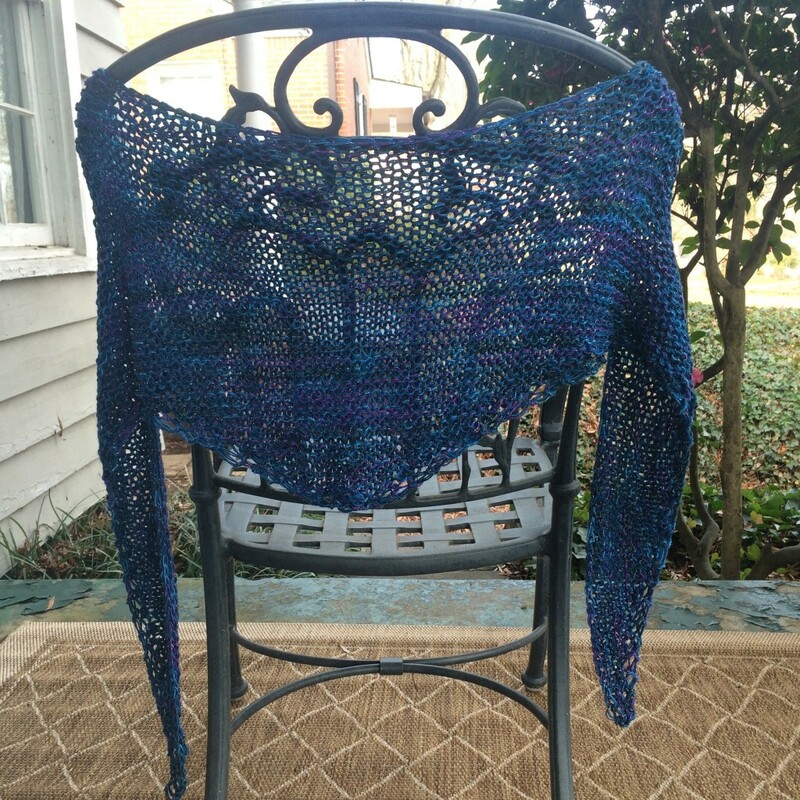 The Blue Heron yarn had a neat metallic feature that gives the scarf a bit of zing. It also has a gradual color transition that gives it a bit of life. Using the Supd & Chloe yarn with it helps ground the scarf. I’ve got enough Blue Heron yarn to do another one, so I’ll probably put it on my needles before too much longer. Holding two different yarns together made this a fun knit. The other project I knitted for my mom was a pair of socks. This was also a fun knit, done in a sport weight yarn on US3 needles. That made them knit up so much quicker than other socks. Mom says they’re really comfortable, so I call it a win. I enjoyed using the larger yarn for socks, and will probably do it again sometime. The color of these socks evokes ocean waves. On the Yarn Thing with Marly Bird podcast that featured Darn Good Yarn, I made it in the call-in queue and won a gift certificate. I used the certificate to get some recycled sari silk yarn and knitted some mittens for my wife. Working with the recycled sari silk yarn was definitely an adventure, and I’ll probably devote a full blog post to it in the coming weeks. But for now, here’s a snapshot of the mittens. 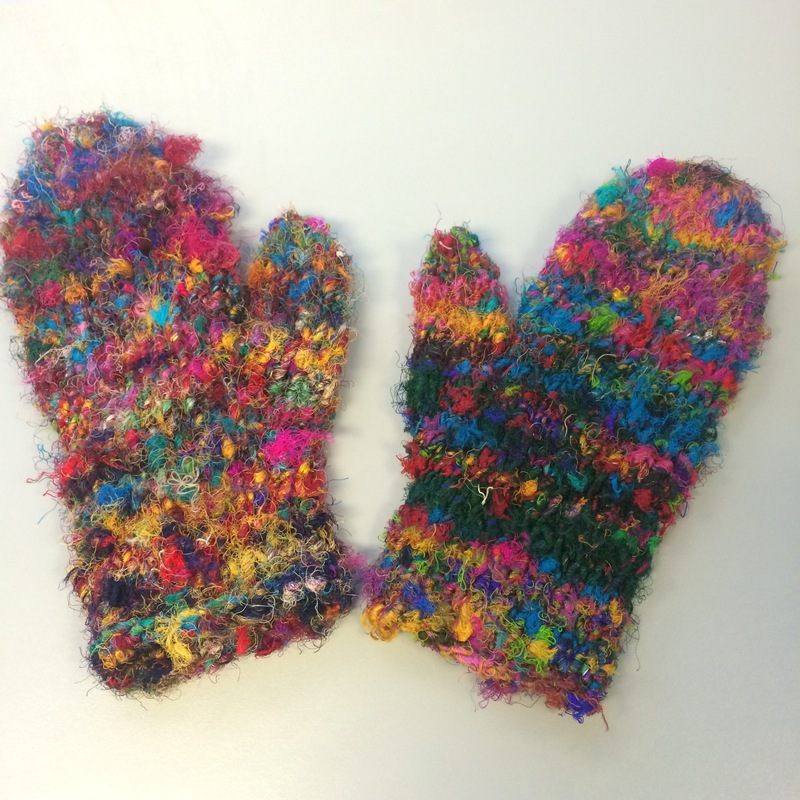 Wild reclaimed sari silk makes fun mittens. I started working on my Beekeeper’s Quilt again! A friend sent me some bacon and eggs mini-skeins recently and I knitted up a hexipuff with part of the eggs mini. I’m going to try to make more progress on my hexipuff knitting now that I’m starting to collect bits an pieces of sock yarn. 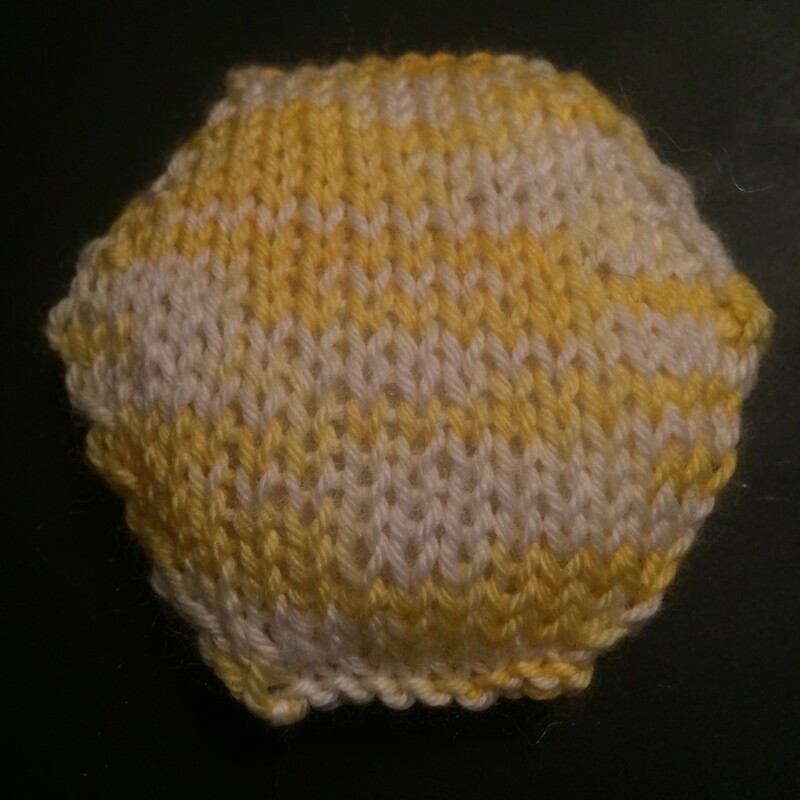 A hexipuff in “eggs” for my Beekeeper’s Quilt. Maybe I need to go down a needle size? At the beginning of the year, I kinda co-started a goofy disorganized KAL for Susan B. Anderson’s Fox in a Vest pattern. We’re having a ton of fun in the thread about it. 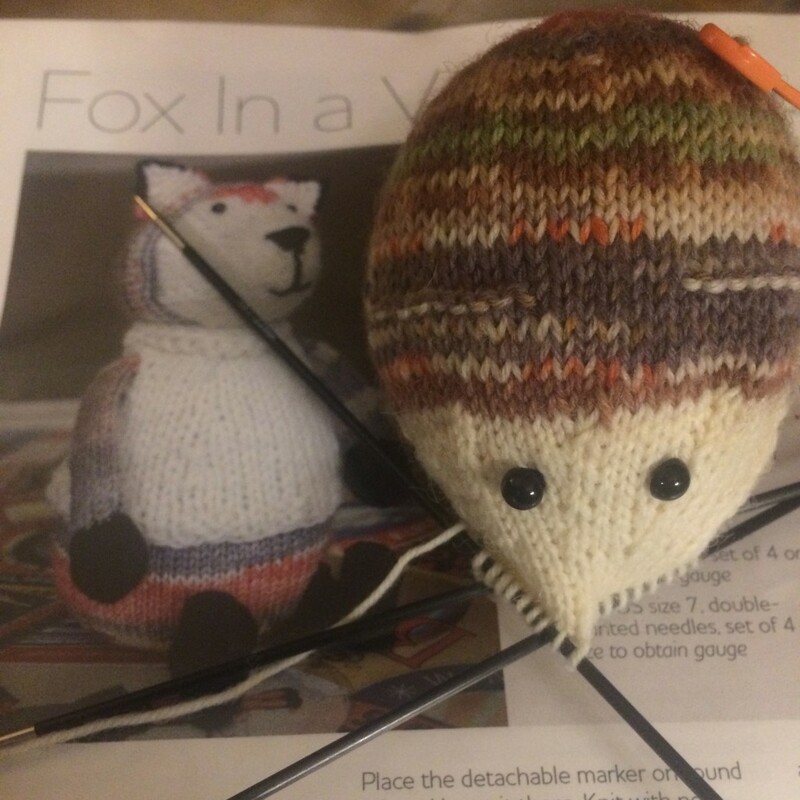 I even managed to cast on my fox about a month after we started the KAL. I’ve almost got the head complete…. About to switch to the fox face. Trying to decide if the 6mm safety eyes are good, or if I should go down to 4mm like the pattern calls for. Finally, I’m making good progress again on my Christmas 2014 socks. I love this self-striping yarn, and I’m excited to be in the home stretch (OK, I just finished turning the heel) for my 2nd sock in the pair. It’s going to be a challenge putting these socks aside until Christmas 2015 rolls around. Partway down the heel flap on my 2nd Christmas Sock. I should be done with the pair soon. Daddy! This sock is too big! For my birthday, I picked myself up a copy of Lara Neel’s Sock Architecture book from Cooperative Press. This is, far and away, my favorite knitting book right now. Lara’s style of writing is something with which I instantly connect, and reading the book feels like I’m sitting in a room, knitting with a friend, and talking about the technicalities and nuances of knitting socks. Her style is conversational enough to be engaging, but underneath that conversational style lies a deep and precise technical exploration of all things sock knitting. 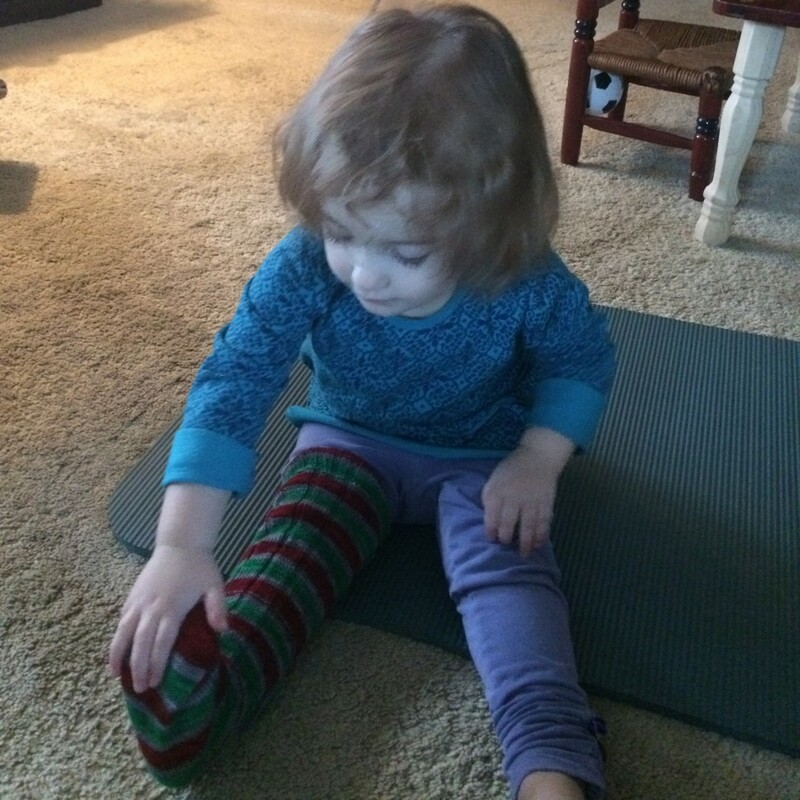 Lara touches on the history of knitted socks and dives right into how socks are constructed. I’m a sock-knitting newbie, with only a handful of completed pairs of socks under my belt and I read this book cover-to-cover — everything was completely accessible to me. I suspect seasoned sock knitters will find a wealth of information as well. This book truly is for any level of sock knitter. This book really is the perfect sock book. If you want sock patterns, there are 17 wonderful patterns. 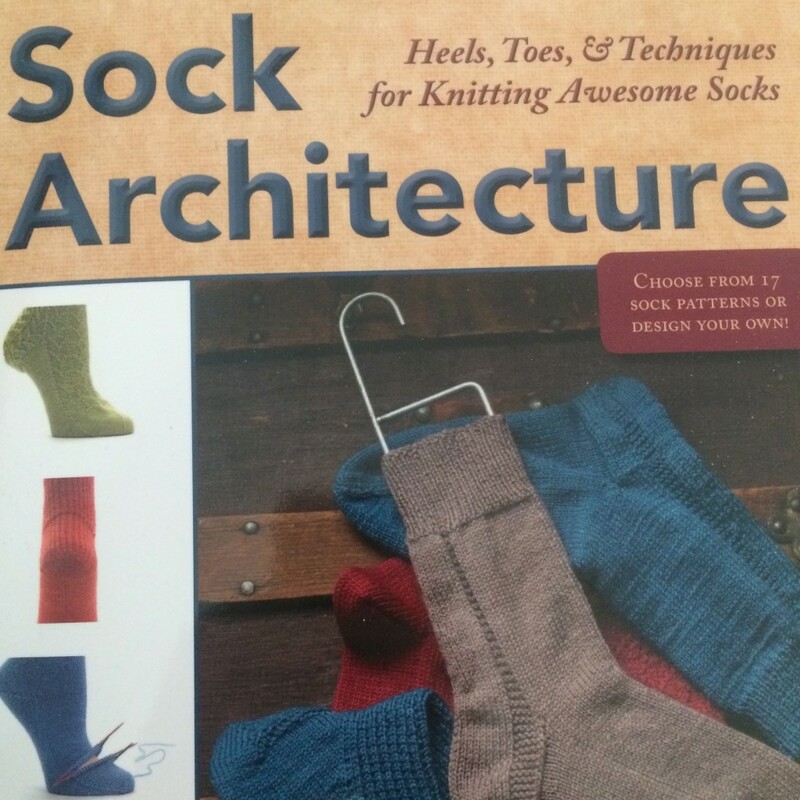 But Sock Architecture is not simply a pattern book. Yes, there are patterns, but the book also includes thorough discussion on all sorts of techniques — toe-up, cuff-down, heels (afterthought and flaps), toes, etc. 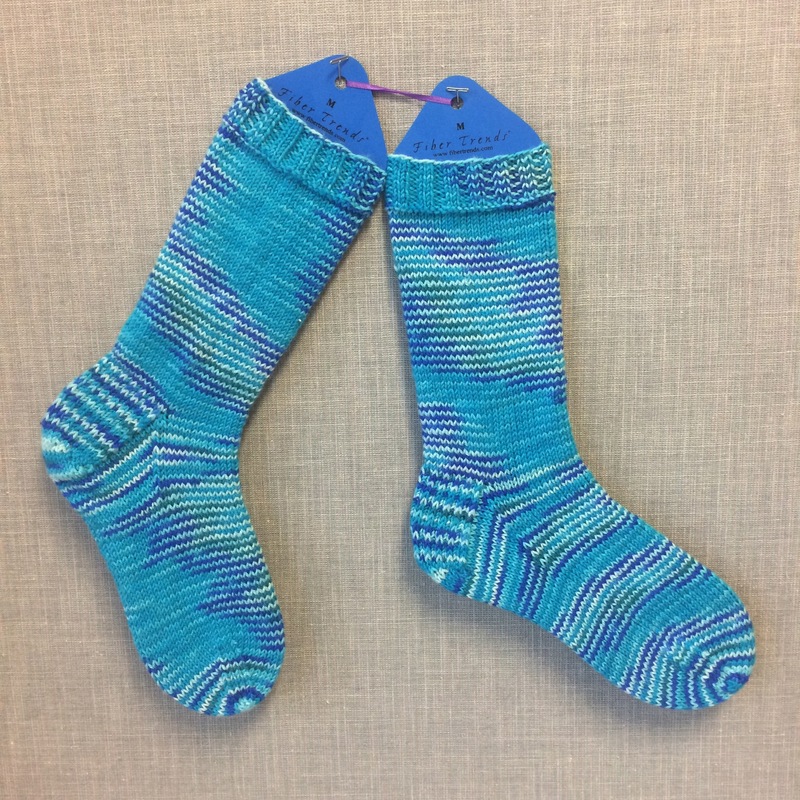 Most of the patterns include instructions for both toe-up and cuff-down, which I thought was particularly interesting — it really showed that a sock knitter can work in his or her preferred method of knitting a sock and come out with awesome socks. Everything in this book serves to build the knitter’s confidence. Where the book particularly shines is in attention to detail. In addition to being full of well-written patterns, the book contains detailed descriptions of all the techniques employed in sock knitting. That’s great, but it’s the photography that sets everything apart. Each sock is expertly photographed from different angles, with close-up photographs of the heel and the toe. I’m sure these pictures will prove to be invaluable as I experiment with new-to-me heel and toe techniques. Lara also includes excellent photography in the technique section, where she thoroughly explains every heel and toe used in the book. In addition to excellent photography of all the parts of a sock in which a knitter is interested, Lara makes another excellent choice for her sock photographs: they are all photographs of solid colored socks. There are so many beautiful striped and variegated yarns out there, and most of these socks would look great with fancy yarn. But if they were photographed with fancy yarn for the book, it would have really taken away from the design of the sock itself, and the ability to concentrate on the details of the techniques employed. Keeping the photographs simple was an excellent decision, and I’m very happy that it was done that way. For the adventurous sock knitter, going beyond the patterns in the book is the obvious next step. There’s a reason this book is called Sock Architecture — Lara’s thorough treatment of the architecture behind making a sock is enough to make a knitter confident in designing his or her own socks. Mix and match heels and toes based on what your personal preference is. Make the leg and foot as fancy or as plain as you like. The possibilities are endless. I’ve already pretty much decided that once I’m finished with my Christmas 2014 socks, the next pair of socks I cast on for myself with be Lara’s Bootstrap Socks. They look really cool. I really think I’m going to work through every sock pattern in this book, and I might even try my hand at knitting toe-up instead of the cuff-down I’ve done for all my socks so far. I’m also excited about trying different heels and toes, and Lara’s instructions for the various options make so much sense to follow that I’m already confident in trying any of them. One of the coolest things about the patterns in this book is that almost all of them are appropriate for men’s socks as well as women’s socks, which is particularly refreshing. Most of the cool sock designs I’ve seen elsewhere really have a feminine touch to them, and I wouldn’t be interested in knitting them for myself or for my dad. Not the case with the patterns in Sock Architecture! Of course, any of the patterns would look great as a women’s sock, too. My only complaint with this book is the same complaint that The Knitmore Girls voiced when they reviewed this book. (For what it’s worth, it’s pretty much entirely the fault of The Knitmore Girls that I bought this book.) That complaint is with the binding. This book would be much better served with a spiral binding so that it could lay flat on any page. Since that issue can be corrected with a trip to the local copy shop and having them cut the binding off and re-bind it with a coil, that’s not a huge deal. I haven’t made it to the copy shop for the rebinding yet, but it’s on my list of things to do. Finally, the awesome thing about picking up your copy of Sock Architecture directly from Cooperative Press is that in addition to getting the paperback copy, you will receive an electronic copy directly in your Ravelry library. For a lot of things, an electronic copy is great — and it will be great for the patterns in this book, e.g. But having a real-life print copy can’t be beat for cuddling up with all of the information that is in this book, and just thumbing through all the pictures. All in all, without hesitation, I heartily recommend this book to any knitter who knits — or wants to knit — socks. I totally dig “Sock Architecture” by Lara Neel. What’s your favorite sock book? How did you learn to knit socks beyond the simple stockinette sock? What’s your favorite heel and toe? Are you ready to become a sock architect? 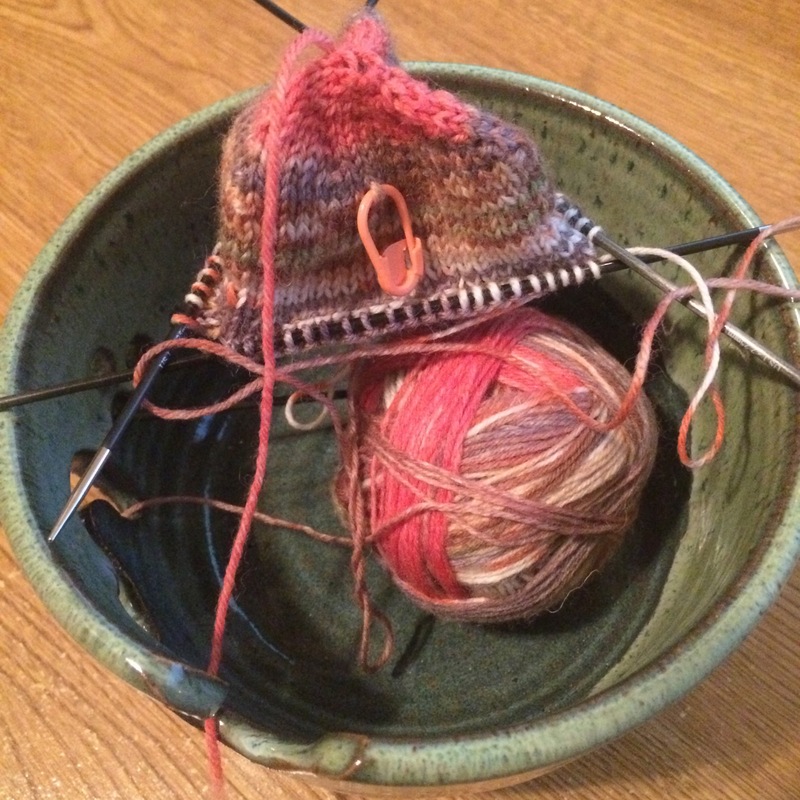 Join the conversation and leave a comment with your thoughts on sock knitting. Hi, Greg – great post. As I’ve said before, I really like the Sock Architecture book too. I also want to try the Bootstrap pattern. My sock knitting thus far has mostly been cuff down, normal slip-stitch heel flap/gusset, mostly vanilla socks, though I’ve made a lacy pair and the short-row-heavy Mystic Spiral pattern (which is the only toe up I’ve done). My main sock recipe is based on Stephanie Pearl-McPhee’s pattern from her Knitting Rules! book (which is where I learned to make socks), which is very similar to Susan B. Anthony’s, which I think you use. I haven’t ventured much beyond the simple sock, because 1) I love self-striping yarn, and 2) I like socks to be mindless knitting. I like my dpns, and haven’t felt the need to learn magic loop. I don’t know if I’m going to change my mind about that, or if that opinion is going to limit my choices with sock patterns. I love that Lara includes both top-down and toe-up for the patterns in her book. Do you use magic loop? It’s funny – for audio podcasts, I mostly use the podcast app on my iphone through itunes, and have had no problem at all with the Yarniacs. It’s set to download automatically, and it has, every time, and played through fine. It’s so weird that so many people had problems, and then so many didn’t. I do use Downcast for video podcasts, because the ones through the iphone podcast app download to both my phone and my ipad, and I don’t want the big video files taking space on my phone. In Downcast I can choose which device I want them delivered to. I should probably just switch everything to Downcast, but I haven’t taken the time to do so yet. Anyway, sorry to write so much! Have a good day. Your sock knitting sounds very much like my sock knitting — cuff-down, plain vanilla, traditional heel flap/gusset. 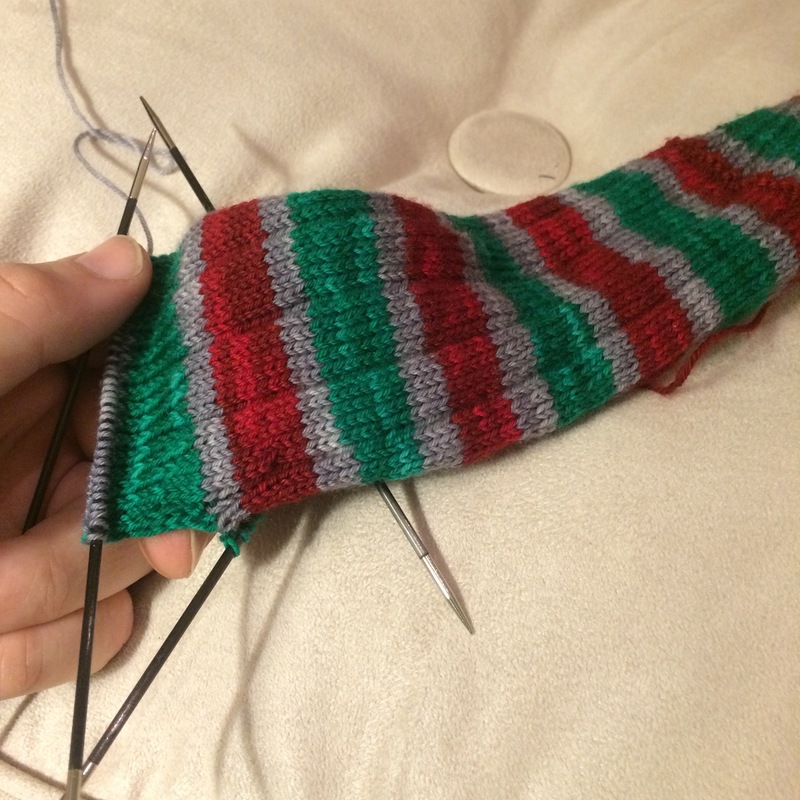 Those Christmas socks are my first self-striping socks, and I absolutely love how its’ working out. I think I might get myself addicted to self-striping yarn, too. I am a DPN Dude all the way. I understand how magic loop works, and used to close off a hat once, but I don’t find the DPNs to be too fiddly for me (which I gather is the main complaint people have about using them), so I’m very comfortable using them. The one technique that has piqued my interest is two-at-a-time-toe-up with two circulars. I like that by using that technique, you can get the socks to match exactly and you can make the leg as long as you can, using up every last bit of yarn. I’m sure I’ll try that at some point, but until then, my DPNs will be the needles that are clicking. I played with the podcast app on my phone, and it just didn’t “click” with me. I’ve been listening to podcasts since loooooong before I had a smart phone, so I’m used to downloading them through iTunes on the computer, then transferring them to an iPod. That’s always been my workflow, and I never felt a need to change it until I had the problems downloading the Yarniacs podcast. Moving to Downcast felt similar to the Podcast app on the phone, but I “got it” better than I did with the Podcast app. *shrug* Anyway, I’m thrilled with my new set-up, and it’s nice to have everything working as expected again. Your blog reads like a podcast. 🙂 I’m working my way through some different heels (afterthought, Fish lips kiss) before buying Sock Architecture. It’s actually the number one thing on my wish list for my birthday in a few weeks. I’m away from my stash right now, and the one thing I have with me is several skeins of sock yarn. I might actually make 12 pairs in 2015, though those quantitative goals have never appealed to me (seems like they’d just cause manufactured stress). Anyway, your review just adds to the million positive ones I’ve already read! Happy knitting! Hi, Mary — thanks for the comment! It’s funny you say that my blog reads like a podcast, and I take that as a great compliment. I’ve been toying around with starting a podcast for a while, and I guess with that idea always in the back of my head, it just kinda helps me write blog posts that follow a podcast-like format. I hope you get a copy of “Sock Architecture” for your birthday, and I’m sure you will love it! It’s nice to hear that even though you’re separated from your stash, you still have some sock yarn. I’m with you about making quantitative goals. I did that last year, and the added pressure did take some of the fun out of knitting. This year, I’m going with the flow. I have general guidelines: I want to knit from stash, I want to make another sweater for Blueberry, I want to make more socks. But nothing with hard deadlines. I think it will be a much more relaxing knitting year for me. How do you knit your socks? Toe-up or top-down? DPNs? Magic loop? I love that there are so many different ways to knit the same thing, and it’s fun watching how other people do it. I just stumbled across your blog today for the first time. 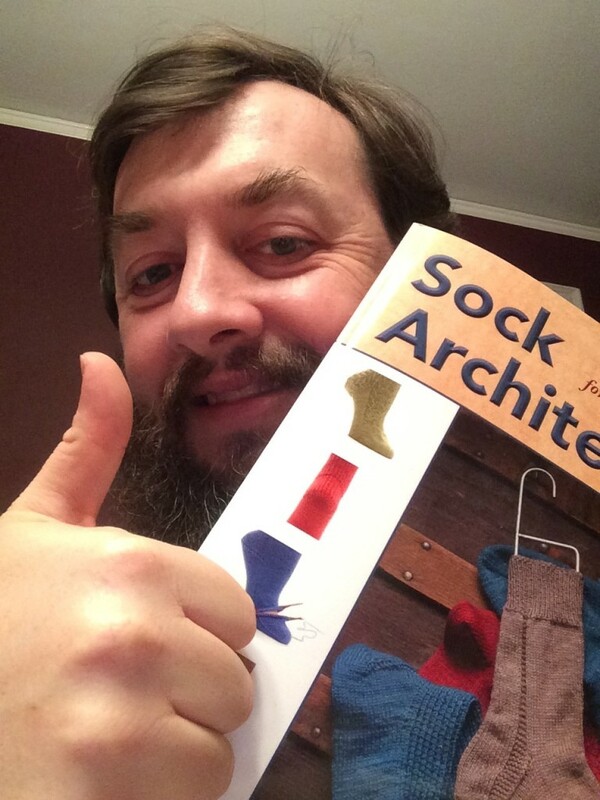 I was already super-excited to get Sock Architecture, and now after reading your review I am even more excited. It’s on my wish list, and I hope to get it for my birthday next month. If I don’t, I will just have to buy it for myself! I am currently knitting my first pair of socks, and I’m intrigued by the idea of trying different heels, toes, etc. to find my “perfect sock template”. P.S. I read your knitting origin story. I love it – what a sweet story! Hi, Karen — I hope you have a Happy Sock Architecture Birthday! You will absolutely love the book. The patterns are great, and extremely well-written. I’m currently knitting the Bootstrap pattern now, where I’m learning a new heel construction that I’m excited about using. But beyond the patterns, you’ll be able to mix-and-match the techniques for heels and toes to find exactly the perfect sock template for your feet. I know I’ll be going back to this book time and time again for years and years of sock-knitting joy.